Use Extreme Caution in building and using this circuit. It Produces Dangerous High Voltage Levels. This Voltage with the Current thats available Can Kill You! Latest Update "August 9, 2016" Added Overlay Picture. of capacitor on pin 2 of the 555 and the particular choke that is used. the output drive to the 22 mfd capacitor. other chokes, but they must be capable of at least a 1 amp rating. Inductance value isn't too critical. Anywhere between 100 and 500 Uhy. should work fine. Of the ones I tested, this one worked the best. There is a provision for "Two storage capacitors" on the board. space on the board and thought this might be a useful feature. I have tried this unit with a total capacitance of 320 uF at 200 volts. Not a fast repetive flash, (about 1 per second) but sure was "BRIGHT." However the larger the Capacitor, the shorter the tube life. flashes, when used at one flash per second. and a few different flash tubes. My understanding of wattage ratings for these tubes is measured in "Joules". And according to the "ARRL Handbook", a Joule is one watt-second. However the Capacitor in a Strobe circuit doesn't discharge to Zero Volts. The Minimun voltage I measure is around 110 volts. 340 - 110 = 230 volts drop. 8.464/2 = 4.232 Watts Dissipation. a life expectancy of 1,000,000 flashes. I am not 100% sure on my evaluation of this, but it sounds logical to me. If anyone has other info, I'd be interested in seeing it. This is a "copy and paste" of the e-mail! My understanding of wattage ratings for these tubes is  measured in "Joules". This is the energy in a given capacitor. This is not correct. You need to think in energy as stored in the capacitor. during 1 second. A capacitor of 1 F charged to 1 V holds a 1 C charge. really, as you and at 110, but it must be higher that that. 0.0368 C * 160 V = 5.888 J. Now, 1 million flashes is quite a lot. 1) The IRF740 mounts on the copper side, Possibly eliminating the need for heatsink. 2) For those interested in this Strobe for use on Model Planes, The Total weight of my proto, including Flash tube is 1.75 ounces. A COMPLETE KIT OF ALL PARTS, NOW AVAILABLE! are made up of cheap surplus parts they are trying to clear out. Part Kits are Available,Email me for Current Prices. The PCB Only is also available, Email me for Current Prices. 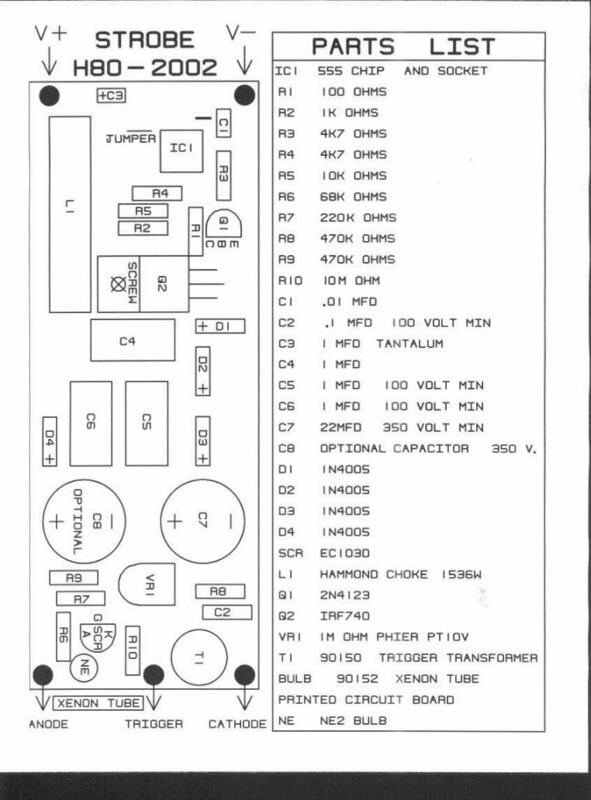 "Return to My HOME PAGE"
Strobe "Parts Overlay and Parts List"
"Pinout of Bulb and Trigger Transformer"
The Trigger Coil May be a differet Style to the one shown in this Picture.